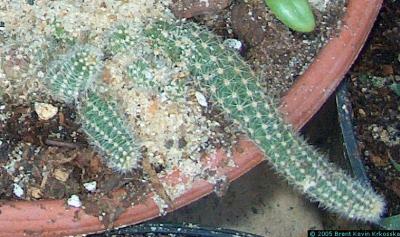 The peanut cactus gets its name from its habit of growing in almost peanut-shaped little segments, I guess. Common names can be tricky, and since they tend to be different in different times and places, I could be totally wrong. Lobivia silvestrii likes the standard well-drained potting mix, easy on the food, full sun and occasional deep watering in its active growing season and minimal water in colder months. In spring and summer it puts out deep red, almost maroon flowers that look too big for such a little plant. Take cuttings be gently breaking off a segment or two when it's actively growing, letting the cut callous on a shelf for a few days to a few weeks, and gently pushing it into the top of the soil, letting almost all of the plant mass sit sideways on top of the soil. Lobivia silvestrii goes dormant in the winter and takes on a red tinge, when I stop watering it almost entirely. When it starts to warm up in the spring, I treat it like a palm tree with almost daily watering until I see new growth. Needless to say, my soil is very well drained.